As a passionate wine collector you certainly want to take all precautions when you are packing and moving liquor and wine bottles to the new residence. If not secured and packed properly, bottles may break easily, which is why the following considerations may be worth paying attention to. – Check if you are legally permitted to bring in certain amount of alcohol for personal use. 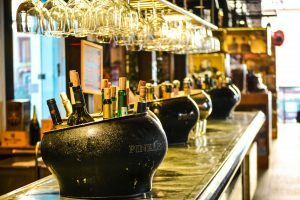 There might be some restrictions regarding the amount of alcohol that can be moved across state lines, so make sure you are familiar with the custom regulations before the moving day comes. – If you own a large collection, you may be interested in hiring a professional moving company. However, not each moving company will be willing to handle your valuable wine and liquor collection. In that case contact several moving companies that are experienced in moving wine and liquor and find out how your precious collection can be moved to a new state without violating any law regulations of the new state. Years of relevant experience, proper packing material, technique, climate-controlled vehicle as well as temperature – controlled and safe storage unit are just some of the reasons why this task should be handed over to the professional NYC movers. – On the other hand, small wine collections can be transported in your own car, where you can adjust the temperature and keep an eye on your wine collection constantly. – Before you start packing each bottle you have, decide what isn’t really worth moving. Since bottles are heavy, consider giving away some easily replaceable wine and liquor bottles. Bare in mind that moving overseas may be very expensive, especially with all duty taxes that you have to pay for the alcohol collection. So, take a moment to assess your collection once again and decide what’s going to be moved and what will end up as a gift for your dear friends and family members. – Get sturdy cell boxes in any box store, liquor store or from a moving company. They are designed to provide the best possible protection, since there is a styrofoam layer between each cell, which prevents bottles from bumping against one another. Also, make sure to line the bottom of the boxes with a protective material and secure them with the packing tape. If you are lacking specialty cell boxes, a safe alternative would be to wrap each box separately with the packing paper and bubble wrap in order to preserve your precious wine collection. Also, use a lot of cushioning material to fill the gaps between the bottles. – Mind packing techniques. Avoid packing opened bottles, but if you for some reason, have to, make sure they are properly sealed. Also, expensive wine bottles should be packed upside down or on their sides so as to prevent the corks from drying out. – Some external factors like extreme temperatures, excessive light exposure or humidity can affect the quality of wine. If you are moving with a reputable relocation company, they will be properly equipped, so your valuable collection will be safe in a climate-controlled moving vehicle. In case you are moving your small wine and liquor collection in your car, find out what you can do to preserve bottles as well as wine quality. – Have high-value collection insured in case of any inconvenience that may happen during the relocation process. – Once the boxes are packed and secured, mark them as fragile, so that your movers and helpers will know how to handle them. – After the collection is unloaded from the truck, refrain from opening the bottles immediately. Let it rest for at least one week before you decide to open it.